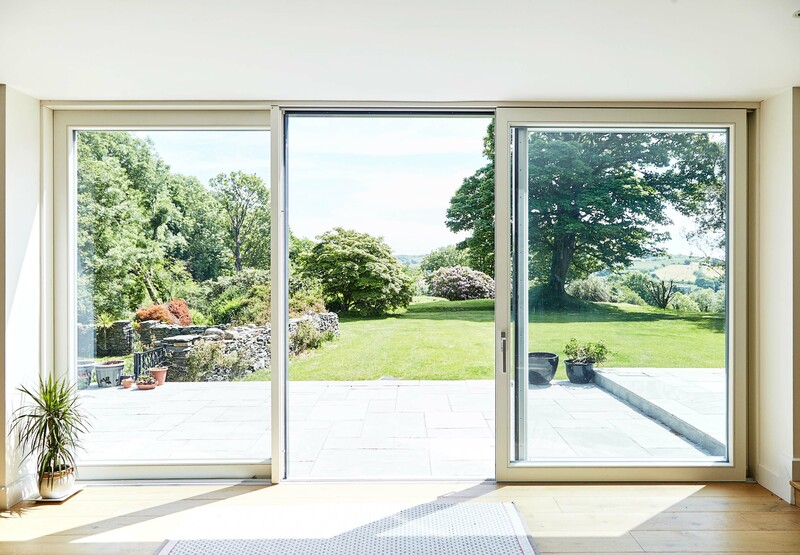 Renovation and Extension of an authentic glebe house in Union Hall, Co. Cork with large aluminium clad wood Lift & Slide Doors, Tilt & Turn, Casement and Traditional Sliding Sash Windows from Signature contemporary range. This house is called “Glebe House”. A glebe was a house attached to lands granted to pay the support of a priest. Originally built in 1730, this was a guest house for visitors to the rectory which was on the same site. Among the many distinguished guests to visit Glebe House was the poet and novelist Jonathan Swift, best known for writing Gulliver’s Travels. The original structure was a simple detached 2 up 2 down room arrangement which was both functional and aesthetically pleasing. 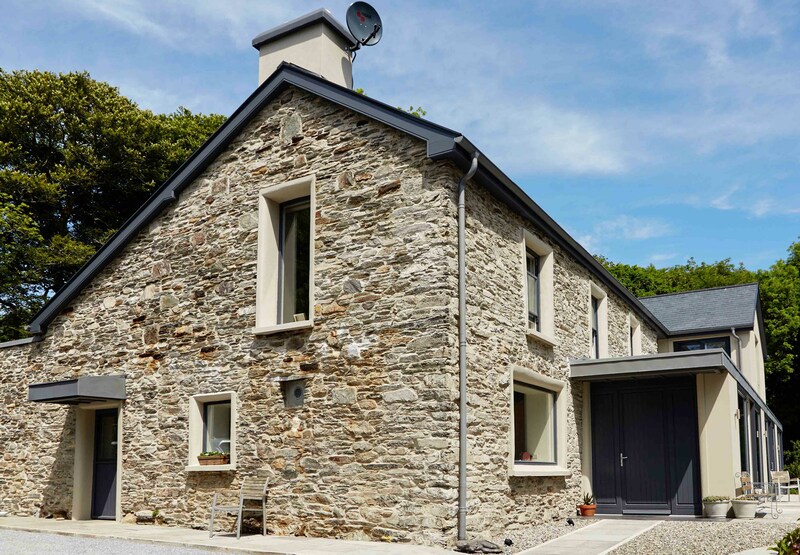 In 2011 the homeowners were house hunting in the Cork area, after having lived a considerable number of years in South Africa. 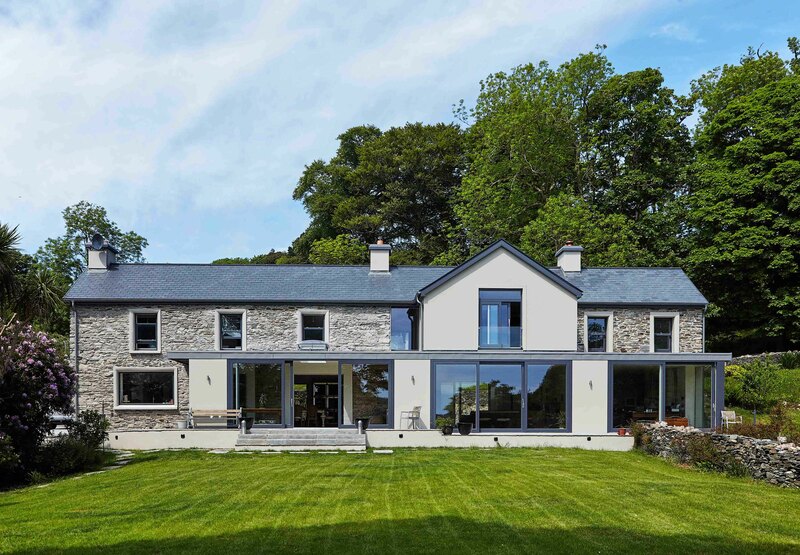 What first attracted them to the house was the mature garden surrounding it and its idyllic setting in the Cork countryside with sea-views at the bottom of the garden. On further investigation they found an authentic glebe house which had remained unaltered in its structure with an outhouse close by. “The only thing I disliked about the house was the pebble dashing to the exterior”, said the homeowner Sheila. They were in no hurry to rush into renovations as the house would serve its purposes for the next few years. This according to the homeowner gave them time to appreciate how the house worked for them on a day to day basis. 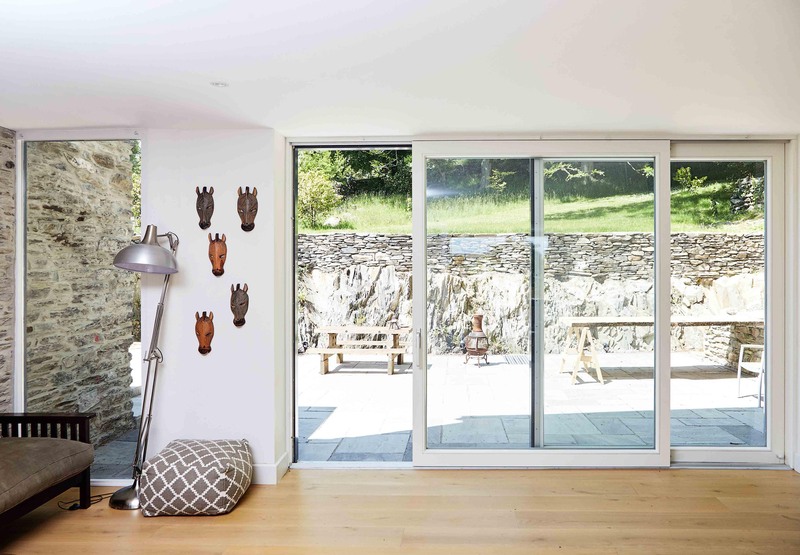 In 2015 Sheila and her husband Tom undertook an extension and renovation to the house that was sympathetic to the original build but enhanced their use of the South facing aspect and gave them a chance to connect with the existing outhouse. 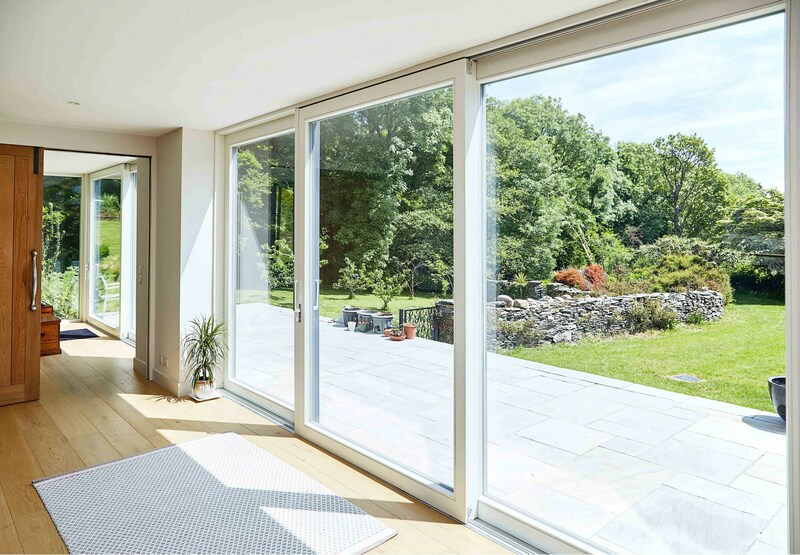 Mary Donohoe and the homeowners agreed that the architectural merit of the original build would be respected and the addition of the sunroom along the South façade would provide for an enhancement of the sea and garden views while maintaining the abundance of natural light by the use of the largest Lift & Slide Doors available on the market (up to 3 meters in high by 8 meters wide) from the Signature window and door contemporary range. 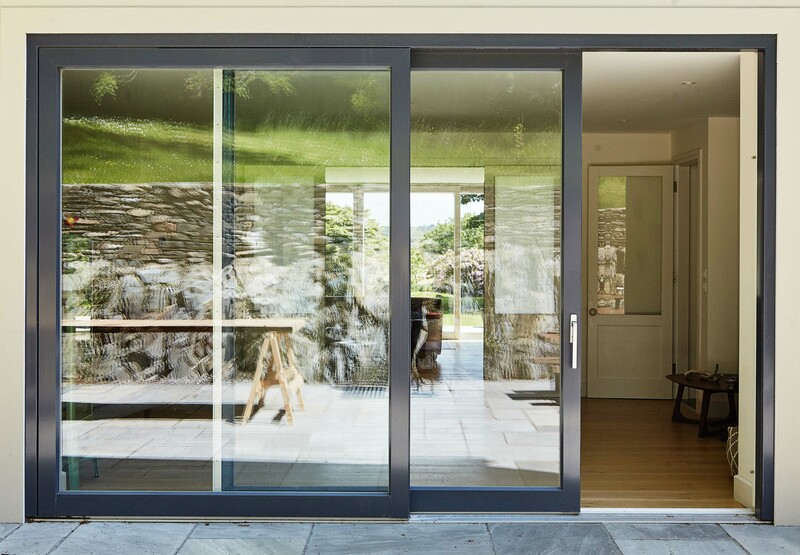 The architect had worked with Signature in the past and recommended the company to the homeowners. 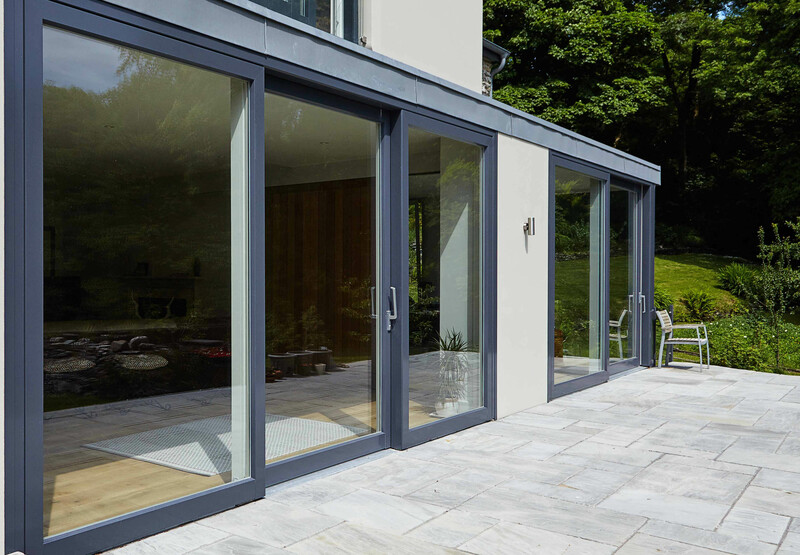 Signature’s Lift & Slide door’s high performance aluminium clad wood and energy efficient glazing big panels with German engineered track system was the most suitable choice for this young busy family due to its low maintenance requirements. Concept builders again on the recommendation of the architect undertook the build to the total satisfaction of the homeowners. 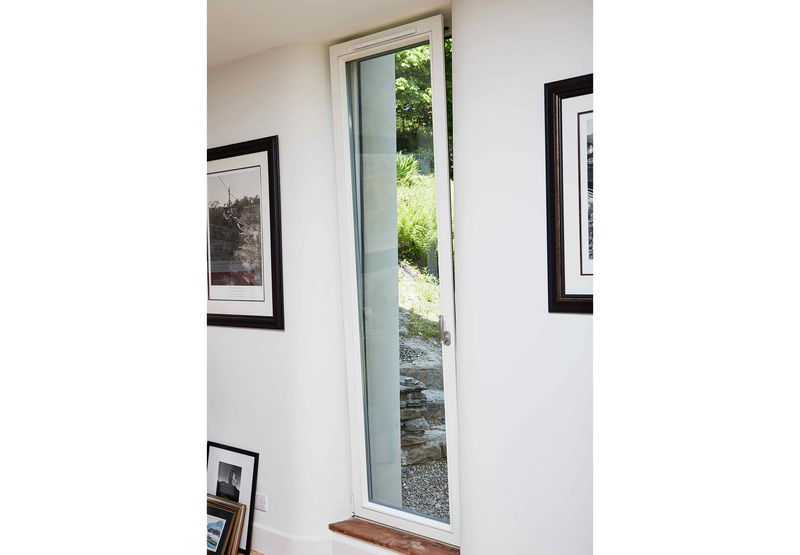 The Signature windows chosen to connect the outhouse with the original were long, narrow vertical style Tilt & Turn windows as the couple wanted to maintain a visible connection between the two. The result is a unique view of a slice through the building showing the original natural stone work and the painted wood windows in complete harmony. 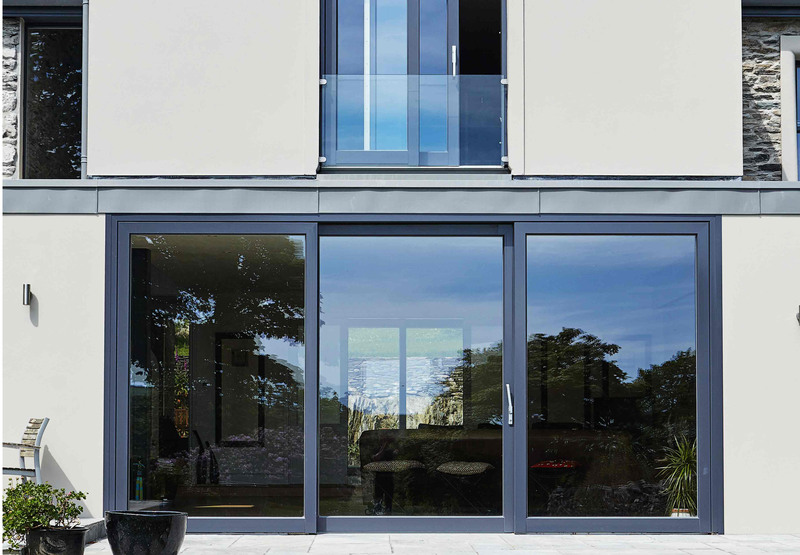 The kitchen’s view to the nature was also enhanced by these effective and versatile tilt & turn style units. The use of natural materials throughout the house was an important consideration of Sheila, who’s an interior designer herself. She used beautiful handcrafted pieces as a reflect of the years she and her husband lived in South Africa. The full wood interior of the Signature windows were custom painted in “perfect neutral” to create a calm, homely, warm interior feel throughout. 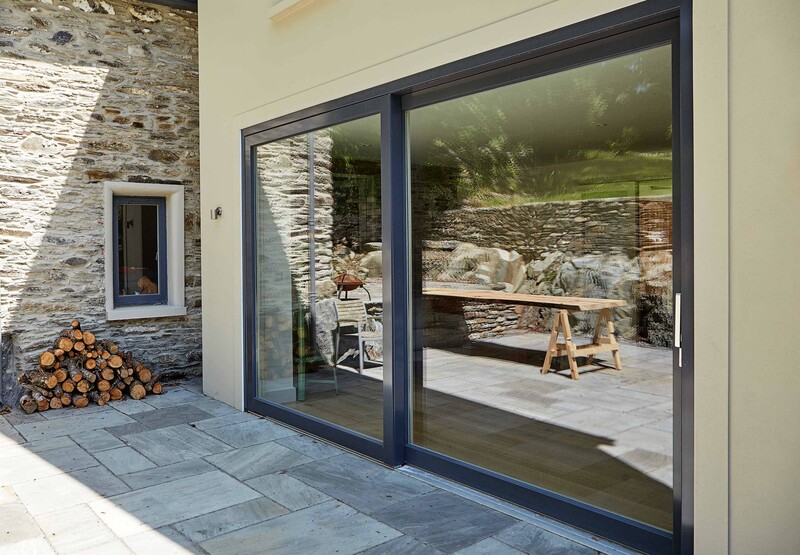 The wood exterior of the windows and aluminium cladding exterior of the doors was slate grey, which integrates with the natural stone and green Irish landscape. The other triumph of the build was Signature’s ability to provide quality traditional box sash windows to match the original. 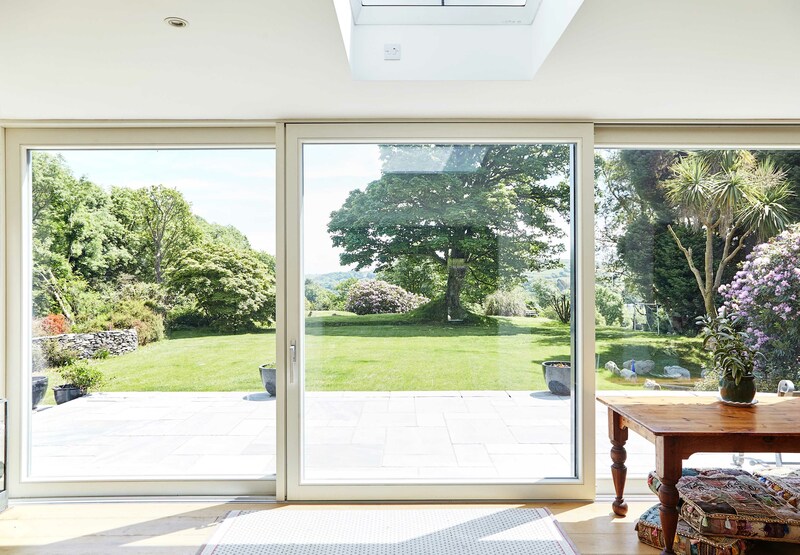 "I thought Signature windows was able to deliver on the brief as they offered the largest Lift and Slide door on the market which provided for un-interrupted views to the garden and enabled the home-owners to enjoy the benefit of natural light to the interior of the existing building. I had also worked with the company in the past and felt confident they would be able to satisfy the expectations of my clients." 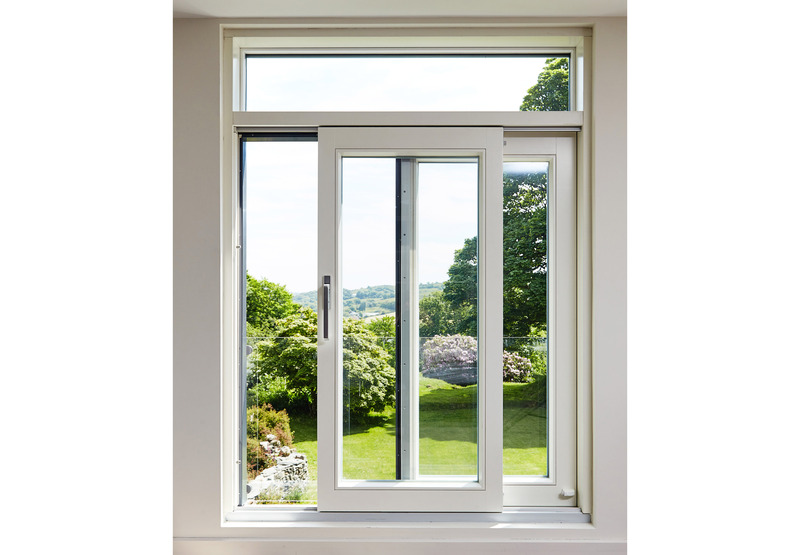 Wood Weight and Cord Sliding sash windows, Wood tilt/turn window, Alu-clad Lift and Slide Doors. 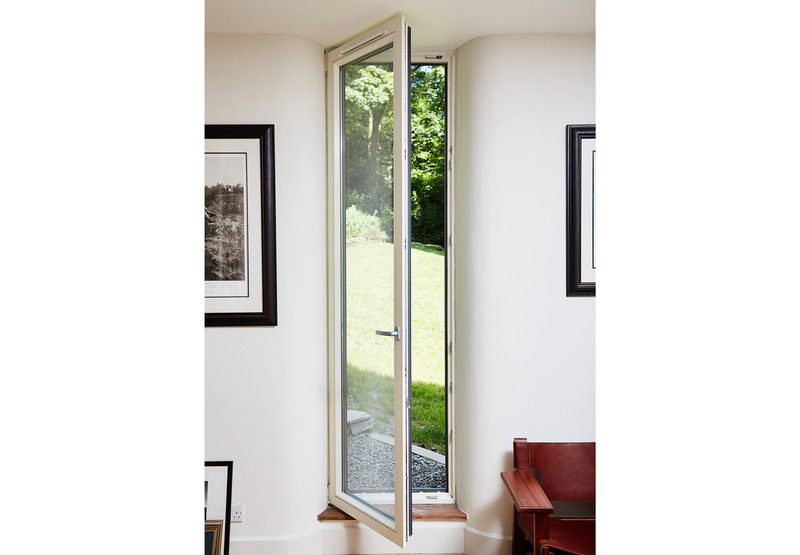 5 tilt/turn, 2 casement, 4 Weight and Cord sliding sash, 3 Fixed, 2 swinging Doors and 7 Lift and Slide Doors. 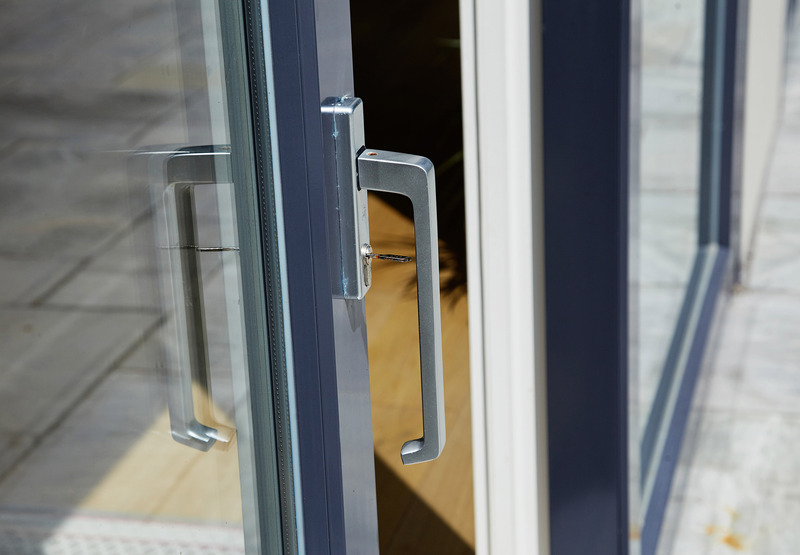 Exterior either wood or aluminium painted RAL7015. Interior pine painted RAL9010. Mix of wood and aluminium. Mix of Traditional and Contemporary.